Jumping bristletails are in the order Archaeognatha (are-KAY-ogg-NATH-uh), a word from the Greek archaeos, meaning ancient, and gnatha, meaning jaw. The bristletail’s “ancient jaw” has only one condyle (a bone that looks like a knuckle) attaching it to the head. This is distinctive because insects of a higher order have two condyles. Fossil evidence shows bristletails are among the most primitive of living insects and first appeared along with arachnids in the mid-Devonian period, which was 419.2 to 358.9 million years ago. Jumping bristletails are found around the world, including the Arctic. There are about 250 species in the world, 24 of them in North America. These insects are called “jumping” bristletails because they can launch themselves several inches through the air. They accomplish this by thrusting their abdominal muscles rapidly and forcefully against the ground, providing them lift-off. 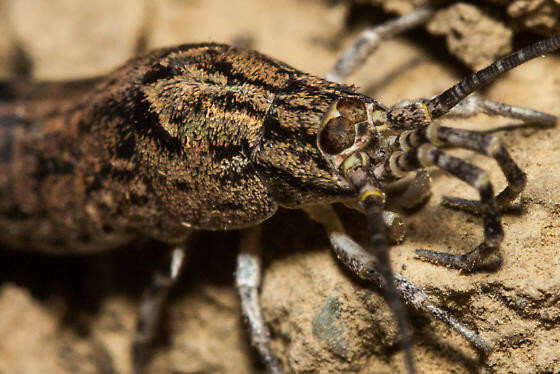 Jumping bristletails have a resemblance to silverfish and firebrats and were classified with them at one time. They’re similar to silverfish, in that they’re wingless, scurry around much the same way and are fast runners, but, there are differences. Silverfish can’t launch themselves as the bristletails do. The bristletails don’t reproduce indoors and seldom inhabit houses, as silverfish do. The bristletails are brownish or yellowish and have mottled or nondescript patterning, whereas silverfish are aptly named for their silver body. Another noticeable difference is the body shape — the bristletails have an arched thorax (the area between their head and abdomen), while silverfish are flattened. And, finally, the eyes of jumping bristletails are large and touch each other in the middle, whereas a silverfish’s eyes are smaller and don’t touch. The “bristles” in the bristletail’s name refer to many small, moveable appendages under the abdomen, which give the appearance of bristles. They’re called style (plural: styli) and scientists speculate that eons ago they may have been limbs. Jumping bristletails have three long appendages projecting from the tip of their abdomen, with the middle one going straight back and being much longer than the outer two. Jumping bristletails undergo simple metamorphosis, progressing from egg to nymph to adult. There are both male and female bristletails, but the two don’t get together in the usual sense. Well, actually, they don’t get together at all — the male merely leaves a packet of sperm (a spermatophore) on the ground for a female to find! It seems a rather happenstance system, doesn’t it? Males of some species perform courtship rituals to ensure that females find their spermatophore. Females find a crevice in which to lay their eggs. The eggs may stay dormant for a year before hatching. Nymphs are tiny versions of the parents, except they don’t have scales. Over time, they’ll undergo at least seven molts, as they grow larger and larger and outgrow their skin. After reaching their full adult size, which may take up to two years, they’ll continue to periodically molt and may live another year or two. Bristletails eat dead leaves, algae, fungi, lichens, decaying vegetation. Bristletails are active mostly at night. In the daytime, look for them under leaf litter, bark, stones and rock crevices. Unlike silverfish, who like a cool, moist environment, bristletails like it hot and dry and most are very common in grassy and wooded habitats. However, some live among rocks on the seashore.